Aaaaand I'm back. Our first camping trip with the Munchkin was a success! Even though we were only gone for a few days, it felt like a week! My, oh my...was it ever a relaxing and fun few days. It rained the day we arrived and carried on (heavily) throughout the night (which made both Brett and I question our plans) but then it was nothing but nice afterwards. The Munchkin enjoyed sleeping in a tent but was a little spooked the first night...which is totally understandable considering that he's never slept outside before and isn't used to the pitch black open air. He was definitely out of his comfort zone and became fast friends with one of our lanterns. Poor little guy! But he was a trooper the entire time and had only 2 meltdowns the whole trip (one of them was due to the aforementioned spookiness of sleeping in the tent on a rainy and dark night). 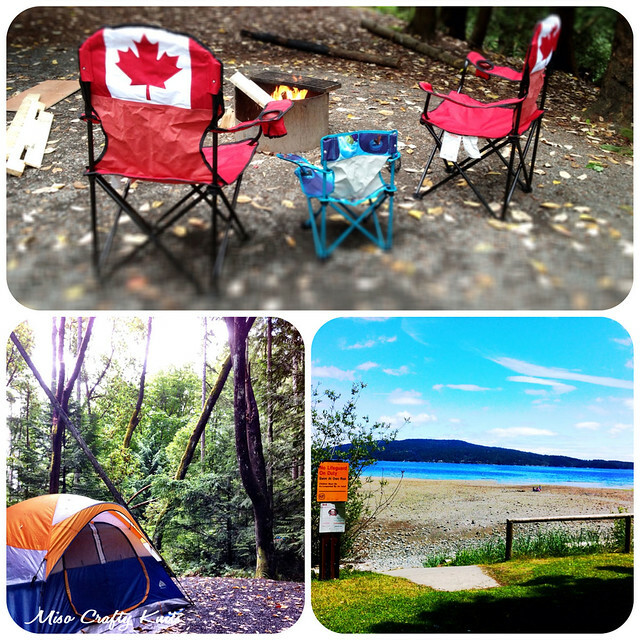 We went to Bamberton Provincial Park, which is only a 45 minute drive from Victoria. I quite liked it there and thought the spot that we were in was perfect. I really hope that we get the chance to go back there again before the summer is over. It had been a loooong time since I went camping last and so I was a little rusty. And by rusty I mean I had to get over my fear of getting dirty, my fear of crawly things (I didn't really get over that, but I was quite tolerable...which is a huge thing for me! ), and was constantly fighting the urge to go find a broom-like branch so that I could sweep our site all Marge Simpson like. That's right...making S'mores by the campfire!! So insanely delicious! And would you believe, this was Brett's first time making a S'more? Crazy, I know! I'll admit, I ate an embarrassing amount of marshmallows. But I don't care, cause how often do I eat camp fire-roasted marshmallows? Exactly! And why do anything half assed? So I went nuts and I swear I was roasting a marshmallow every 10 minutes. I convinced Brett that we needed to buy a bag of the insanely huge marshmallows (see the photo above? Top left corner...yeah, that's a regular "jumbo" marshmallow that you can buy in any grocery store on the right. That's the epic marshmallow on the left...yup...that's your big boy right there). 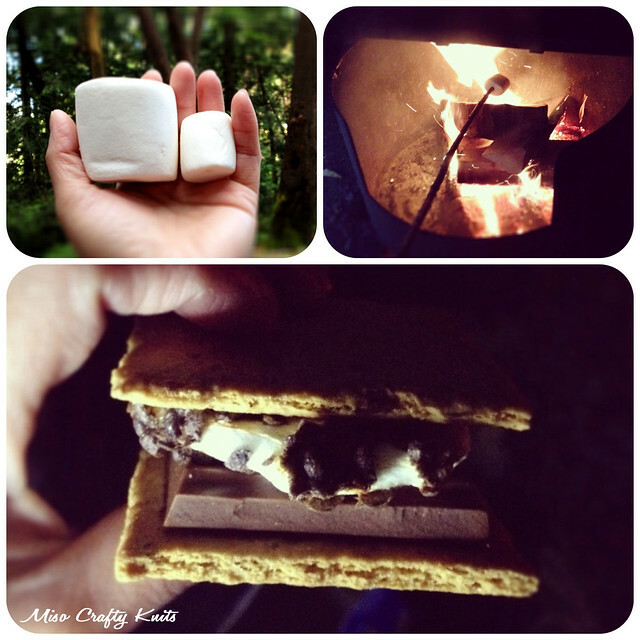 Those marshmallows were fun to roast and were more of a novelty, but made for an unproportioned S'more. And I think more of them fell into the fire than were eaten cause of their weight. I also did a fair amount of knitting considering. Brett took the Munchkin on a hike and to explore the grounds while I opted to stay behind to "man the fire" (re: I poked it from time to time with my trusty poking stick). I managed to knit up the foot of a sock and a huge chunk of shawl (more on these projects later). I also had to deal with untangling a lot of yarn barfs. I thought I would give knitting from a center-pull ball of yarn another try...yeah, I think I'll stick with knitting from the outside in. I had to untangle yarn more than I did knitting of the yarn. I don't remember encountering this much yarn barf back when I used to knit from the inside out. It was quite nice to be "unplugged" for a few days, even though I wasn't completely cut off the internet (I still had 3G on my iPhone) and I did post a few photos on Instagram. I did whip out the phone a lot to take pictures but I wasn't glued to it trying to check up on all the social media sites and it was nice to enjoy quality time together without someone (ahemBrettahem) constantly texting or Facebooking it (I actually got to see Brett's eyes, not just the top of his head as he bends over his phone). Brett did have a good laugh to find me sitting in front of the fire with my iPad next to me while I was knitting (hey, my knitting pattern was on there!) 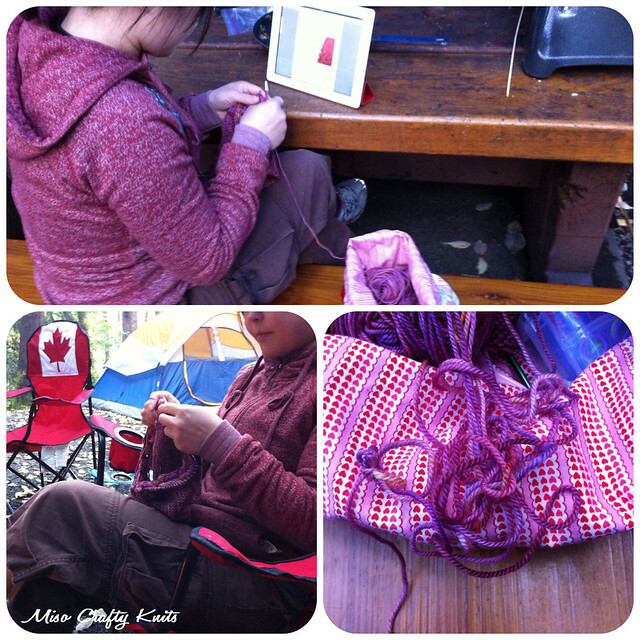 when he and the Munchkin came back from one of their adventures, and thought how much the times have changed when he saw me set up at the picnic table knitting while our dinner was cooking. Nice! I've never camped in Bamberton, I'll have to check it out. We too had those ginormous marshmallows on our trip to Strathcona, I hated them! Lol. The OCD in me that needs the proper ratios of things, couldn't handle how off balance they made our S'mores! My S'more was literally swallowed by the marshmallow!!! You should definitely go! I want to go back again, that's how much I like it there! I told you my sweet tooth is out of control! ;) Those humongous marshmallows didn't even stand a chance! We haven't been camping in ages and with little squishy due in a few months it's probably going to be a while before we get a chance. I have never made s'mores. They aren't really popular in Australia but they look delicious. Next camping trip I'm giving it a go.